In this article we will give an educated approach without a bias towards Soft Washing Vs. Power Washing. Our background is in both areas and with years of experience and hands on learning we feel professionally confident that we can educate our customers on both Power Washing and Soft Washing. cleaning roofs with the Soft Wash method for over 20 years. The application of Soft Washing has become the safest and effective way to clean Fungus and Algae growths on many surfaces. As the Eastern United States climate has been changing, coupled with material used to manufacture roof shingles, we’ve come to discover and learn about those ugly black stains on our roofs, also know as Gloeocapsa Magma. During the course of this time, almost without intent Soft Washing other surfaces was discovered. The practice of Soft Washing within our area is relatively new.Cleaning pavers, concrete and other surfaces require a certain amount of heat and pressure. Roof cleaning, Stucco cleaning and dryvit cleaning require a Soft Wash system for the best results. If your business or property requires Soft Washing, here are a few tips that can assist you in choosing the right company. Ask to see the system they suggest will bring about the very best results. Inquire briefly about the system and how it operates and what you can expect from the results. Detergent usage, pressure and the overall application during the cleaning process are great starting points. 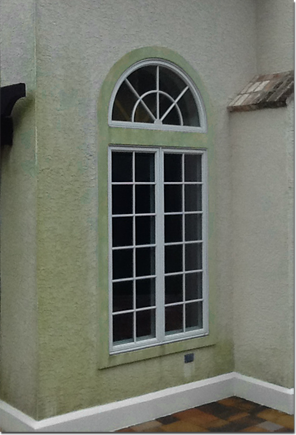 If the contractor is legitimate they will be able to explain in detail the Power Washing or Soft Washing application. Check for a Website and photographs of their work and reviews. A history of photographs and customer reviews are a great way to demonstrate a company’s track record. Aqua Boy Power Washing can do just that and we take photographs of our work to demonstrate just how reputable and experienced our company is. What is Soft Washing? Soft Washing is not Power Washing, although both applications deliver a detergent and rinse. Power Washing delivers water / detergent through a pump driven by a gas or diesel engine. The pressure of a Power Washer can be regulated, but does not have the detailed finesse a Soft Wash system has. Now most portable power washers you find at your local hardware store are geared for PSI cleaning. Basically knocking off the dirt and algae with pressure. True professionals do not operate these types of machines. They are effective for smaller household projects. In fact there are power washers out there that offer exceptional pricing and utilize these machines as their form of cleaning. By utilizing pure water pressure to clean doesn’t solve the problem, it may look cleaner, but the Algae / Fungus growth will be back much quicker. You may have been happy you’ve saved a little money, only to realize your residence will need another cleaning much sooner then you anticipated. Cheaper is not always better. 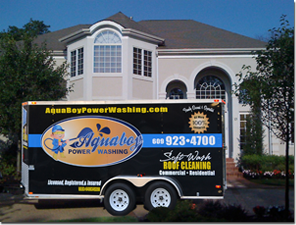 With Aqua Boy Power Washing you get what you pay for every time. Soft Washing is an outstanding cleaning technique for many applications. It’s a basic system, much like what your professional pest control or lawn fertilizer guy uses to deliver chemicals. It consists of a 12-volt pump and a sprayer. You may see one or two 200-gallon poly tanks. The Soft Wash system delivers pressure equivalent to a garden hose. Detergents and the final rinse are sprayed from a PVC wand with accuracy. . Soft Washing can be an excellent cleaning technique for residential and commercial projects. Soft Washing can be considered more of a treatment application without the pressure and water usage you see from a professional Power Washing system. Soft Washing and Power Washing have their advantages and differences. Hire a professional that is equipped with both for the ultimate results. Aqua Boy Power Washing can deliver experience and quality workmanship in either cleaning application.